The usage of Herbie Hancock’s Rockit deserves better. Kickin It Old Skool starts in 1986 with Justin, a 12 year old immersed in the break dancing scene along with his friends Darnell, Ali, and Hector. Together, they make up a group known as the Funky Fresh Boyz. They are ready and primed to steal the show at the annual school talent show, and Justin is ready to impress his crush Jenny with an insanely difficult but impressive headspin move. All that could go wrong with this move does, and the botch leaves Justin (Jamie Kennedy) in a coma for 20 years. Just before the decision is made to take him off of life support, a familiar tune is heard and the now 32-year old has risen from the bed. Quickly, he finds that his parents are struggling, but there is hope in the form of a dance contest. Win, and with $100,000 the family problems can be solved, and he may even be able to win the taken Jenny (Maria Menounos) back from longtime foil Kip (Michael Rosenbaum). All he needs to do is get the old crew back together, while acclimating to 21st century culture. Like those previous films, no one can truly knock the dancing; it is well-choreographed and fun to look at, even though it goes on way too long here. But there are other aspects that are off-beat in the worst way. Early on, a feeling is had with KIOS that it doesn’t quite know its target audience. On one hand, its humor is reliant upon its lead and co-stars to be as childish/juvenile as possible, placing it seemingly in the demographic of a typical adolescent comedy. On the other hand, many allusions towards ideas, objects, and more 1980’s paraphernalia exist that only a person who lived in the 1980’s could truly understand, and it is debatable as to whether they would find it funny. Based on the $4.4 million domestic gross on a $25.7 million budget, no one in any age group seemed to find this funny, or cared much to get out to this one. What’s more troublesome that the film takes the extremely easy route in painting its diverse co-stars in Bobby Lee, and especially Miguel A. Nunez and Aris Alvarado, as nothing more than stereotypical Asian, African American, and Mexican-American characters. It is hardly funny hearing Darnell’s (Nunez) get rich “Jewbix cube” scheme (in addition to dropping the N bomb multiple times throughout for no real reason), or seeing Hector’s (Alvarado) tubbyness and hearing his vato accent, or Ali’s (Lee’s) occasional butchering of the American language. It is just cringeworthy. They are able to bring one or two sparse laughs, mainly as the film goes on and gets away a little from the stereotypes, but it doesn’t wash the bad taste away from the early goings. 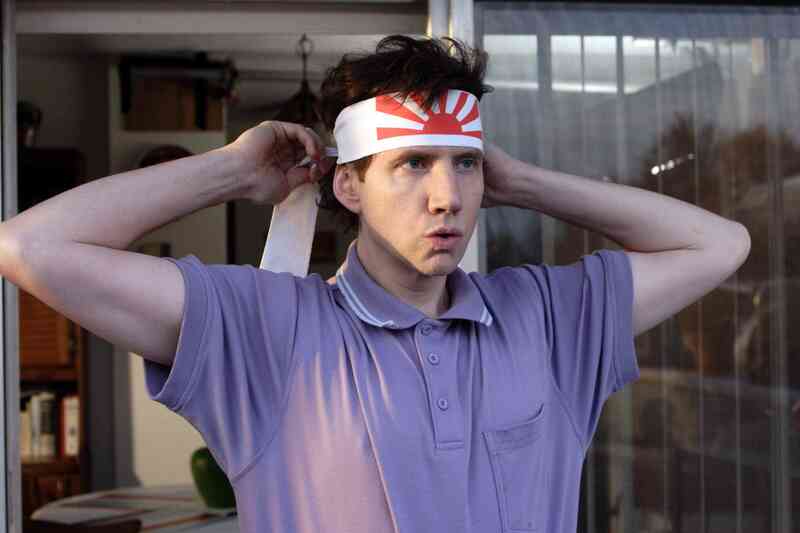 And of course, there is Jamie Kennedy as the headliner here, and it may not be an exaggeration to say that he is the least funny thing in this movie, which is sort of a problem when the story revolves around you. Yours truly says this as not a Kennedy hater; while he’s far from great, he was solid in Malibu’s Most Wanted (guilty pleasure). Whether a fault of the writing, his performance, or a likely combination of both, Kennedy’s character as a complete buffoon. Instead of being a 12-year old in a 32 year old’s body, Kennedy’s plays it more like a six-year old from body language to dialogue, and the way he reacts to certain things feels like he trying way too hard to elicit a laugh. At the very least, his chemistry with love interest Maria Menounos is passable. The real semi-saving grace of Kickin’ It Old Skool? None other than Smallville’s Lex Luthor himself, Michael Rosenbaum. He pretty much nails it as the rub-it-in, pompous nemesis to Justin as Kip. His character is an undeniable jerk, and he knows it, plays up to that, and looks like he is having a good time in doing so. In one of the more random characters in any movie, Frank C. Turner’s is credited on IMDB as only the “Crazy Homeless Man.” That is an apt description, as everything he does is crazy while decked out in homeless garb. Lowbrow humor certainly, but yours truly would be lying if I said I didn’t chuckle once or twice. And of course, any flick paying homage to the 80’s seems to have cameos featuring those stars of yesteryear, which is no different here. None add no value whatsoever. By and large, Kickin’ It Old Skool is just like how its title sounds: Stupid. One or two occasional good dance moves cannot hide bad dancing skills. Photo credits go to flixster.com, impawards.com, and Google. Good review for a terrible movie. lol Great job! Have you ever seen it? If you haven’t, obviously no need to really bother haha! Thank you! It’s still semi-amusing in spots, but I guess I never noticed how juvenile and sort of reliant it was on unfunny racial jokes lol. Hehe, awesome. Love Herbie Hancock. I’ve never actually heard of this film. Yeah I live under a pretty sizable rock. I have seen a bunch of these dance type movies that like you said were all around the place way back when – my old flatmate was obsessed with them, played ’em alllll the time… In fact now that I think about it, I have probably seen this without realising, going by your description. Appreciate the comment Jordan. You probably have seen it, but even if you haven’t, chances are you are in the majority of those who haven’t seen based upon the box office for this.